Už to budou tři roky! V létě 2015 jsme se s kolegy z práce pustili do stavby herního (hracího) automatu pro arkádové hry z 80. let. Cíl projektu? Zahrát si hry jako Pac-Man, Galaga, Donkey Kong, Double Dragon a další. Chcete začít s elektronikou a nevíte jak? Že neznáte schématické značky a nemáte tušení, jak se takové elektrické schéma čte? Jaký obvod je vhodný pro začátečníka? Kde začít? Yesterday, I decided to update this blog and use latest WordPress theme Twenty Seventeen. This theme has one awesome feature – video header on main page. You can see it in action right here if you are reading this blogpost on a big screen (more than 900px). Smaller displays will get static image only. 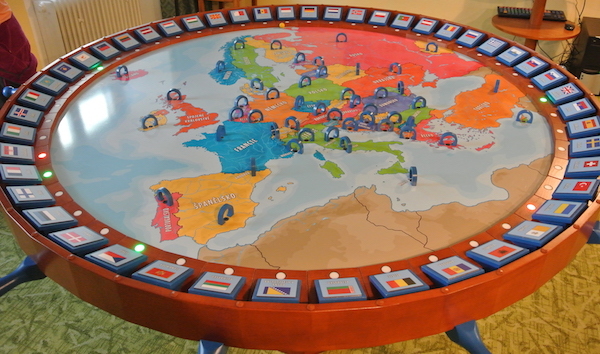 Europe is an interactive educational game for children (and adults). It was quite a big project spanning several months and several people with different specialisations were involved. The official opening was on 22 April 2016. This article describes design decisions for electronics, implementation and lessons learned. Main board of Europe game.